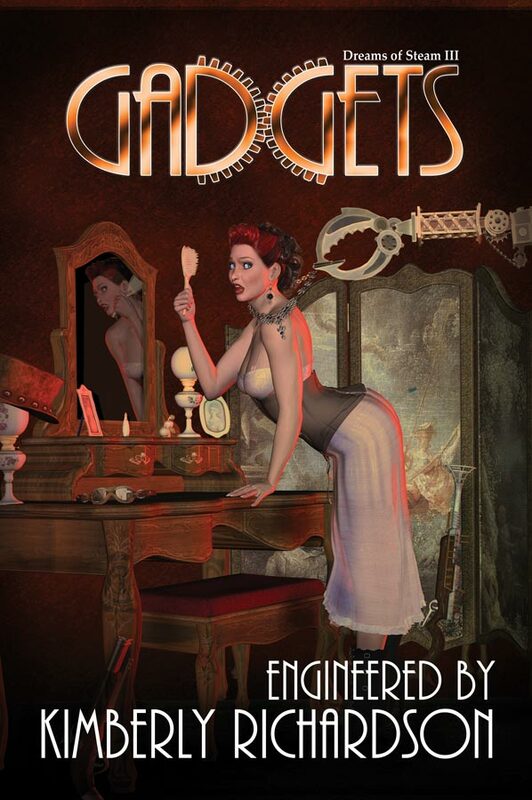 ← Check Out My Steampunk Short Story in Dreams of Steam 3: Gadgets! I haven’t been able to blog much about this, but my steampunk short story, “The Survivor” was recently published in the Dreams of Steam 3: Gadgets steampunk anthology. I figured for this Sample Sunday, I would give you all a bigger sample of the story than what I have published on my website. “The Survivor” tells the story of Angelica Blackmore, the lone survivor of the HMS Phoenix, Great Britain’s first airship attempt that ended in disaster. Here are some links to purchase the book of you are interested. The silhouettes of two men, each wearing custodial helmets, emerged from the smoke. Police, thought Angelica. A pleasant development. They might be able to help her reach her destination or at least give her a hint of her location. She ripped off the goggles, stowed them in her purse, and held the briefcase behind the ruffles of her skirt to prevent them from noticing it. She took a deep breath and stood up. The men hurried toward her the moment they saw her. They gazed at her with concern and pity. Her midnight-blue dress, lined with black and bits of teal, was smudged with dirt and grass stains. She assumed the graceful twist that swept her hair up had been ruined. Soot probably covered her face, and her high-lace shoes most certainly bore scuff marks. Angelica started to say not at all, but her throat tingled from all the smoke she had inhaled. She coughed. The young policeman offered her his arm and noticed the briefcase. He reached for it. Angelica moved the briefcase away. “Thank you, but I’ll carry this.” She slipped her hand into his arm and allowed the man to guide her across the field. “What happened out there?” he asked. A booming creak reverberated from the wreckage site. Angelica and the officer turned and watched what resembled a molten, round skeleton collapse to the ground with a metallic groan. It was October 21st, 1886—a day that, if the Royal Navy’s plans had succeeded, would have changed the course of British military history. Angelica had gathered with the rest of the ill-fated passengers in a field outside London at ten o’clock. Military officers, ministry officials, lords, and other persons of importance waited for the inaugural flight of the HMS Phoenix, a dirigible class R10. The Royal Navy had chosen to test the dirigible at night. They hoped to keep from arousing the suspicions of Britain’s enemies if they succeeded and the suspicions of the Times if they failed. The Phoenix, composed of a white, horizontally-cylindrical balloon more than 800 feet long, was much bigger than Angelica expected, even from the plans she had been given. Underneath the balloon hung a gondola with two decks of cabins, a dining room, and a storage compartment. Moonlight reflected off the ship, and Angelica decided they should have chosen a color other than white if they truly desired secrecy. They boarded the gondola, and the airship rose. Angelica originally feared the wind would toss the ship about, but she found the ride smooth, quiet, and pleasant. She stayed in the background for most of the night. She preferred watching people to participating in their political games. After an elegant dinner, the initial excitement of flight had worn off, and most of the passengers retired to their rooms. Angelica lingered in the dining room where plates of partially eaten food still spotted the tables. She sat on a plush, velvet bench right next to one of the French-paned windows that surrounded the bow of the hull, allowing patrons a full view of the sky. Below, the lights of London flickered. She watched the Thames River wind through the city, resembling a black snake slithering among embers. She checked her watch. One fifty-nine. The time to begin her assignment was nearing. She stood up and stretched, preparing herself for her first task. Before she could move, the ship shook ever so slightly, throwing her off balance. She spotted a half-drunk glass of wine and noticed the liquid tilted toward the port side of the ship. Eerie, orange light flooded in through the windows indicating the balloon had burst into flames. In five to ten minutes, fire would engulf the ship. Angelica’s stomach lurched. The Phoenix was descending, speeding toward the ground below. She had precious few minutes to complete her assignment. The airship’s passengers, bellowing with panic, flooded into the dining room, and the crew tried in vain to calm them down. I must find the professor, thought Angelica. Her mission’s success depended on it. The frail, timid man traveled alone and would require assistance. Angelica hunted for him, navigating the humanity frantically running about. The ship continued to tilt. She opened each cabin door, searching for him. The last door in the hall was locked. She knocked on the door. “Professor Guthrie?” she yelled. A muffled cry sounded inside. Angelica suspected the professor could not traverse the floor’s steep incline to unlock the door. “I’m going to get you out, sir!” she yelled. Angelica flicked her right hand back. A three-inch-long, needle-thin dagger shot out of her sleeves under her wrist. She inserted it into the lock, and with a few jiggles, opened the door. She jerked her wrist down, and the blade retracted into the spring-loaded sheath hidden under her sleeves. The door fell open inward. A thin, balding man with a long beard leaned against the wall, which in a few minutes would become the floor if the ship continued to tilt. He clutched a briefcase to his chest. Angelica tried to keep her balance—despite her heeled boots and corset—as she shuffled down the steepening incline. “Who are you?” he asked. He had a high-pitched voice and beady eyes. The professor hesitated for a few moments. Then he reached for her hand, and the two struggled up the incline to the starboard side of the ship. “We’re going to jump out of the window and roll out of the way,” she yelled over the din. “Why couldn’t we have used my window?” asked the professor. The two of them climbed into the room and tried to open the windows. They were locked. “Move away from this window,” Angelica said. She flicked both hands up and aimed each spike at the window, breaking the glass. The professor teetered and almost lost his balance. She grabbed his hand, hopped on the windowsill, and pulled him out. They crouched on the side of the ship, watching the fire, which almost engulfed the balloon, move toward them. They jumped out of the gondola together, leaving behind both the blazing airship and the professor’s shrill holler. This entry was posted in Books & Works by M. B. Weston, Short Stories & Other Writings and tagged angel, author, Dreams of Steam, Elysian Chronicles, fantasy, guardian angel, M. B. Weston, movies, publishing, speaker, steampunk, warfare, writing. Bookmark the permalink.